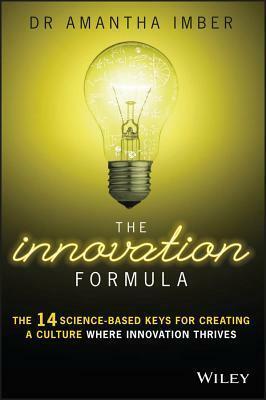 “The Innovation Formula: The 14 Science-Based Keys for Creating a Culture Where Innovation Thrives” by Amantha Imber (John Wiley &Sons, $21). ▶ Individual deals with challenge and talent utilization. When jobs are set up so people can complete tasks without much thought, the same-old-same-old minimizes creativity and productivity. Routine marginalizes everyone’s ability to use their talent. ▶ Autonomy and recognition play roles, too. When people are always told how things are to be done, they believe that suggesting changes will fall on deaf ears, and stay quiet. Those who don’t, are viewed negatively as rocking the boat and making waves. Given an opportunity to explore and pursue ideas, employees will develop new-and-improved methods and solve problems created by situations that aren’t part of the routine. ▶ Team involves the appreciation of the perspectives of others. Without diverse viewpoints, it’s difficult to determine the cause(s) of a problem. In such situations, the silo-dwellers often fight their win-lose turf wars. This leads to a solution that treats symptoms not causes, and often creates more problems (i.e. unintended consequences) — and builds higher silos, not longer bridges. When people openly express their ideas and perspectives and discuss them, they see the bigger picture. They see connections and realize that divergent — rather than what’s-in-it-for-me or convergent — thinking provides the path to finding the causes of problems, developing and analyzing alternatives and making decisions. ▶ Leader creates goal clarity for individuals and the team. In its narrowest sense, goal clarity states “just do your job.” Imber sees clarity as defining challenges and expected outcomes and then allowing the individuals and teams latitude in figuring out how to achieve the goals. Developing their how involves creating a path to progress — a series of small goals and milestones that help people identify achievement clearly. She stresses the need for a constant flow of two-way communication about how. This allows for celebration of small wins and timely identification of obstacles and their workarounds. Management and employees stay engaged throughout the process. This formal clarity structure lays the foundation for “Unstructured Time” (UT), which allows employees to explore their own ideas. On the surface, allowing UT can be a difficult choice when management and employees see overloaded inboxes and shifting priorities. Below the surface, UT provides employees with some control over what they do. They make sure they do their jobs and make time for UT. Employees inform supervisors of their UT initiatives and management helps them connect dots with others with similar interests. Big fish like Intuit (10 percent UT), Google and 3M (20 percent UT) found that UT yields ongoing achievement in process improvement, customer service and individual skill development. ▶ Organization embraces risk-taking from the top down. The firm sees failure as “failure for success.” Fear of failure always limits options. With limited options, you can’t optimize results. Accepting failure without stigmatizing it, pushes people to do things they didn’t know they could do. When it comes to success, failure is an option. Takeaway: Before reading the book, share the “Innovation Culture Audit” with the team and the higher-ups. The results create a 360-degree evaluation of innovation’s place in the priorities of the firm and identify which levels on which to focus your attention.